Explore Montreal’s Old Port in an easy and entertaining way — by quadricycle. 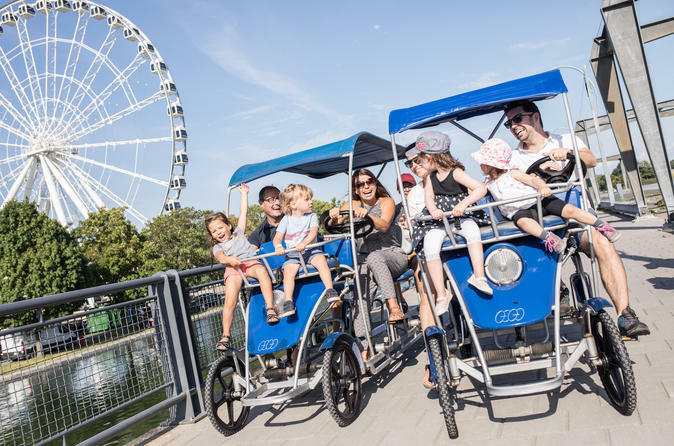 A 4-wheeled non-motorized vehicle that’s powered by pedaling, a quadricycle allows you to enjoy the fresh air, see Montreal’s waterfront sights and cover more ground than you would by walking. It's similar to riding a bike, but you get to do it with your friends or family. Choose a 30- or 60-minute rental period. Your quadricycle rental starts at Jacques Cartier Pier (Quai Jacques-Cartier) in Montreal’s Old Port (Vieux-Port). Check in and listen to a few safety tips before hopping in your 4-wheeled ‘bike’ and taking off on your own exploration of the port area. With your friends or family, pedal around for either 30 minutes or one hour, depending on the option selected at booking. Travel up and down the Montreal waterfront, checking out attractions like Bonsecours Basin Park and the 150-foot (45-meter) clock tower located on Quai de l’Horloge (Clock Tower Quay). Maybe stop for ice cream or a cold drink when you need a break. With everyone pitching in on the pedaling, you’ll get a fun workout and enjoy the Old Port in a unique way. When your time is up, just return the quadricycle to the pickup location.